​African mango is a species of African trees in the genus Irvingia. They bear edible mango-like fruits, and are especially valued for their fat- and protein-rich nuts. It has been proposed as assistance in weight loss. The mechanism is not fully understood. 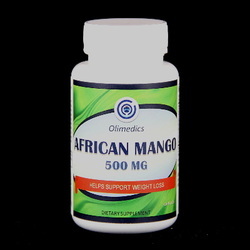 Take 1 capsule orally 1 to 2 times daily preferably with meals or as directed by a healthcare professional. This product should be used in conjunction with a sensible diet and exercise program. This product is manufactured and packaged in a facility which may also process milk, soy, wheat, egg, peanuts, tree nuts, fish and crustacean shellfish. KEEP OUT OF THE REACH OF CHILDREN. DO NOT USE IF SAFETY SEAL IS DAMAGED OR MISSING. STORE IN A COOL, DRY PLACE.